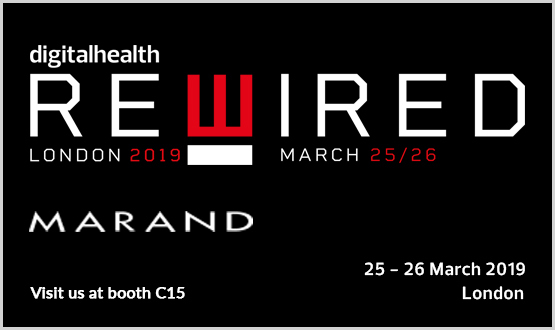 Marand will be participating at the Digital Health Rewired conference at the Olympia London on 26 March 2019. The Rewired is the new multi-event conference and exhibition focusing on joining up and integrating health and care through the transformational use of technology and new ways of working. You can visit our team of experts at booth C15, where we will be showcasing and discussing our health data platform Think!EHR Platform™ and closed-loop medication management system OPENeP. Amongst the speakers on the second day of the conference will be our CEO Tomaž Gornik, who is also the co-chair of the OpenEHR Foundation. He will be part of the Clinical Software track (at 1.00 pm) in a session which looks at open platforms and “EPR 2.0”. The Rewired conference will also be our official rebranding event for the UK market so find us under the name Better at stand C15, next to UK Cloud and Innovation Theatre. Marand’s vision for healthcare IT is coined as "Integrate. Open. Innovate." Think!EHR Platform™ is well aligned with this vision as it uses IHE-based standards to integrate existing devices, systems and data. By storing data in an open, vendor-neutral format it enables ecosystems of vendors to innovate. This approach is fuelling next-generation solutions known as the Postmodern EHR.